Do you still smell the big stink that was raised when Israeli WTA player Shahar Pe'er was denied entry to Dubai? Well, everyone in the Middle East is happy again! See, this week's women's tournament went ahead with a lot of grumbling, despite the fact that an Israeli could not compete because she wasn't allowed into the country. 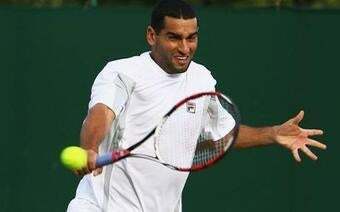 However, the men's version of the Barclays Dubai Tennis Championship will take place next week and Andy Ram, also of Israel, will reportedly be allowed to enter the United Arab Emirates and will play. Hooray international peer pressure! U.A.E. officials say they denied Pe'er's visa over security concerns—her security, of course—but there's no word on how awesome security has become in the last three days to justify the change of heart. Perhaps the threats to pull other sporting events from the country were finally taken seriously. Or maybe they just don't like broads. And if the whole thing doesn't depress you enough, there's a report that an upcoming Davis Cup match between Israeli and Sweden—in Sweden!—will be played in a empty arena because of security concerns. Sweden! My IKEA furniture seems a little more fragile than it did yesterday.